Final day for the WOC-WTOC 2014 in Italy. Switzerland wins female relay and the overall medal table. Sweden second and Denmark third on the final table. Last day of the 2014 World Orienteering Championships in Campomulo di Gallio (Veneto Region), today, and it was time for relays and…déjà-vù. What happened in the rainy Italian summer was a photocopy of what happened last April in sunny Portugal, when Switzerland and Sweden got the European title, turned today into a World title. Sweden and Denmark seemed to have the women’s relay in total control until the second changeover, when Judith Wyder jumped onto the field and recovered over 2 minutes delay in only 5 controls. Alexandersson couldn’t keep her pace and the thrilling last battle was between the Swiss and Maja Alm of Denmark. Wyder eventually took a clear victory before Denmark and Sweden. On the men’s side, the Swiss team started well and the second leg runner Daniel Hubmann reached the arena for changeover almost a minute ahead of Sweden and France. But Gustav Bergman was ready for his personal show and the last leg for the Swede was simply breath-taking. 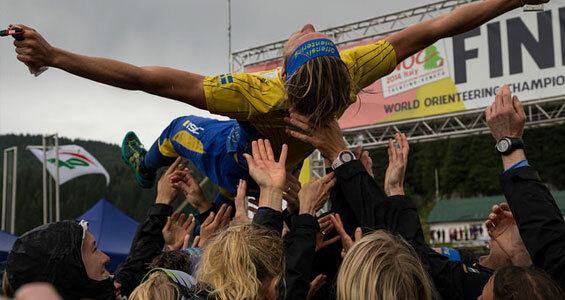 Bergman and his team grabbed the World title by 1 minute and 9 seconds before Switzerland. France finished third, another déjà-vù from EOC! Regarding the total medal count, hats off to Switzerland (3G, 4S, 1B), Sweden closed second (2G, 2S, 2B) and Denmark got the third spot (1G, 3S, 2B).